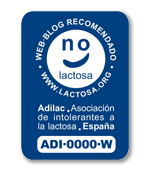 Adilac grants the ‘recommended website-blog’ seal to websites and blogs that it considers can make life easier for those with lactose intolerance. Each seal is unique and consists of an alphanumeric code that identifies the website/blog. Adilac maintains an updated registry of the websites with the valid seal and revises them annually in order to evaluate their renovation considering the maintenance of the principles they were created for. The basic purpose is the distribution of lactose-free recipes. They have a clear purpose and obvious aim to help those with lactose intolerance. They do not have a commercial or entrepreneurial purpose. They guarantee that they use products that do not include lactose in the elaboration of their recipes or clearly identify recipes that are suitable for the LI as there is no lactose among the ingredients. Dairy traces: In the case of using any products that states it contains ‘traces of dairy’, they commit to clearly warn in their recipes of the possible presence of dairy traces in the same. People which high sensitivity to lactose may not tolerate the undetermined presence of these traces and therefore it is obligatory to warn this when creating and explaining the same. Information regarding intolerance: All information referring to lactose intolerance, food that can be consumed, etc. must be extracted from the Adilac website, with the source and a link to our website being clearly shown. This information must also be always updated with regards to the content on the Adilac website. Non-compliance with these principles or conditions will imply automatic cancellation of the use of the seal. 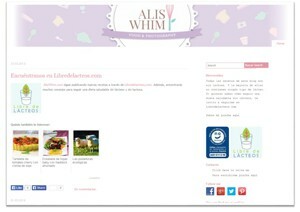 Adilac will notify the cancellation of the permission to the owner of the website/blog who must remove the seal from their website/blog within 15 days. The owner has accepted to respect the following principles. Adilac will revise each of these pages annually in order to ensure that they continue to respect the principles for which they were granted. Adilac declines all liability derived from the content of the pages to which the seal has been granted, from its interpretation or the incorrect application of the information stated on the same.